When it comes to legible handwriting, spatial awareness between letters and words makes a huge difference! Whether you are a teacher in the classroom, a parent who is struggling to find the trick to get your child to write legibly, or a therapist working on the underlying skills needed for functional written work, you've probably noticed that when letters are smashed up against one another, it's really hard to read what's been written! Stretching out spaces between words makes a huge difference in legibility. And there's more; Using consistent spacing between letters can help with legibility too. 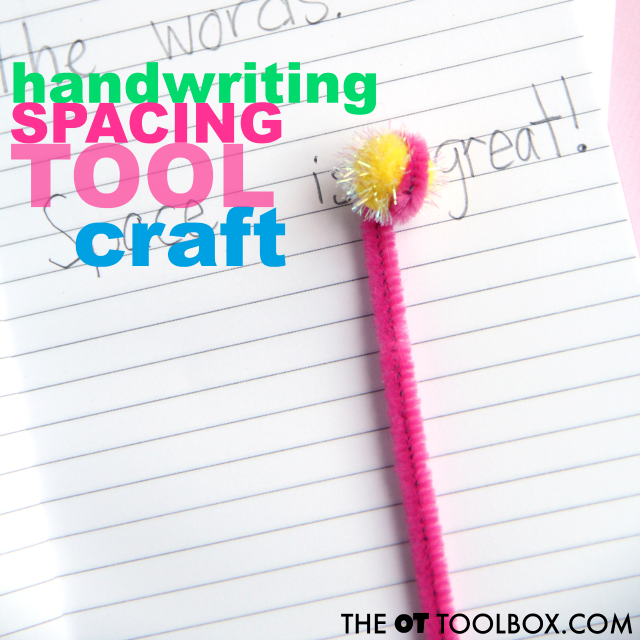 That's why we're sharing this easy DIY handwriting spacing tool craft. It's a do it yourself version that kids will take pride in making and using. Many of us have used and love spacing tools made from craft sticks. This space man themed spacing tool is one of those fun DIY spacing tools. Here's ANOTHER craft stick spacing tool with a visual cue. Today, we've got a spacing tool that doesn't use a craft stick...it's another fun DIY spacing tool idea! Working on spacing in handwriting? Why not start a handwriting club for kids? Kids can work on handwriting skills in a fun way. Here's how to start a handwriting club kids will WANT to join! This spacing tool uses items that you probably already have in the house or classroom. Kids can use their creative style in making their spacing tool and really make it their own. We used a few materials to make our spacing tools. Our items came from www.craftprojectideas.com. You could also use beads for a smaller space between words. This project is super simple to put together. 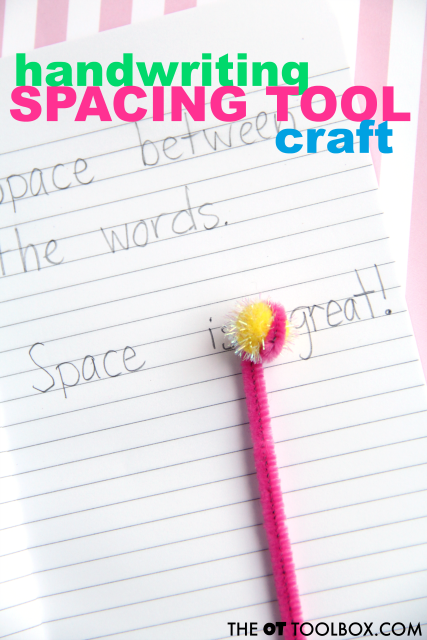 Creating the DIY spacing tools is a nice fine motor warm up to writing, too! If you are using a crafting pom pom like we did, use a smaller sized pom pom. A 1/4 inch crafting pom pom is a good size. Once the pipe cleaner is wrapped around the pom pom a couple of times, the size will increase. Wrap one end of the pipe cleaner around the craft pom pom several times so the pom pom is secure. A dab of craft glue can be used to secure the craft pom pom to the pipe cleaner, if you like. You won't want the top of the spacing tool to be too wide, otherwise the space between words will become too stretched. A bead makes a nice spacer for spacing between words. Once the pipe cleaner is wrapped around the bead, there is a nice sized spacer for words. Use the spacing tool to space between words using the top of the space tool. 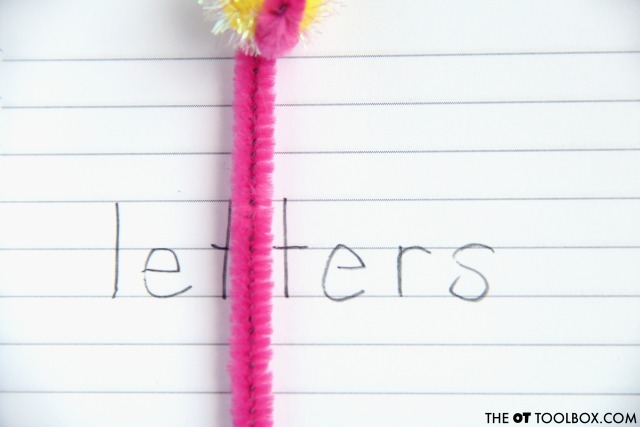 The width of the pipe cleaner can be used to maintain a consistent space between letters. These handwriting spacing tools can be as varied as the students in a classroom. Allow the kiddos to use creativity when making theirs. Bend pipe cleaners, add additional beads or other embellishments like ribbon or twine. Students will be proud to show off (and use!) their spacing tool when practicing handwriting and spacing between letters and words!